Though it had been well over a decade since I last slipped into a kayak, I couldn’t wait to test out my sea legs once again. 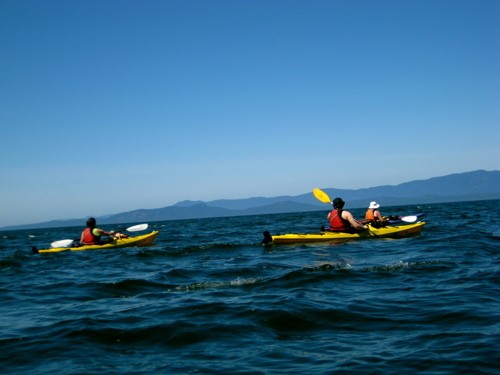 When Rebecca and I first started planning our girls’ getaway trip to Vancouver Island’s Oceanside region of Parksville and Qualicum, I was very excited to see that an afternoon kayak trip with Adventuress Wilderness Adventures for Women was first-up on our itinerary. 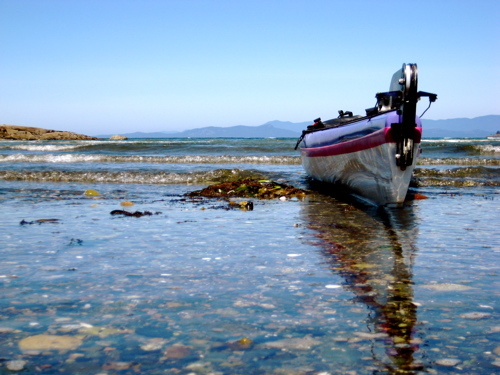 After a quick lunch in Nanaimo, we arrived at Wall Beach in Nanoose Bay for a PFD fitting. I also made sure to slather my skin with plenty of sunscreen (sun + sun reflected off water = double trouble) and ensured maximum fashionability with my brand new aquasox. 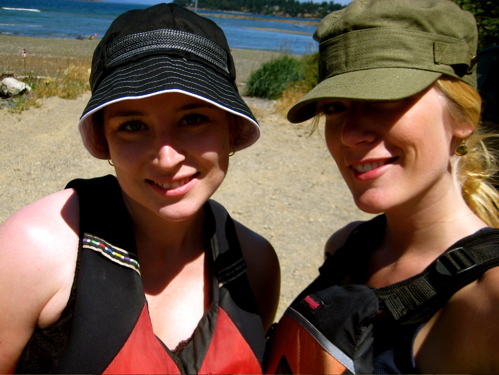 After zipping up our lifejackets, we quickly slapped on our new hats and were ready for our crash lesson in kayaking. While both Rebecca and I had been before, it’s smart to take some time to review safety rules, procedures and to agree to stay in a group. 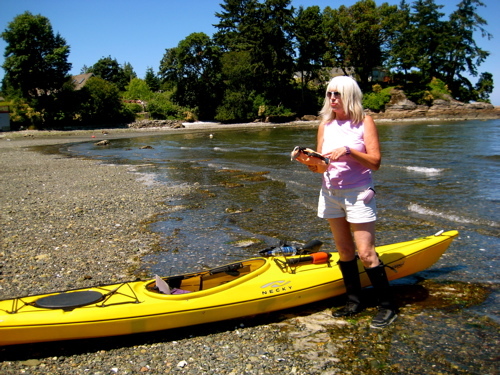 Guiding kayak tours of the region for close to 10 years, Jan Kretz is an adventuress who knows what she’s doing. She’s got a fun attitude and a deep love for the ocean – something that was apparent to me from the moment we met her. 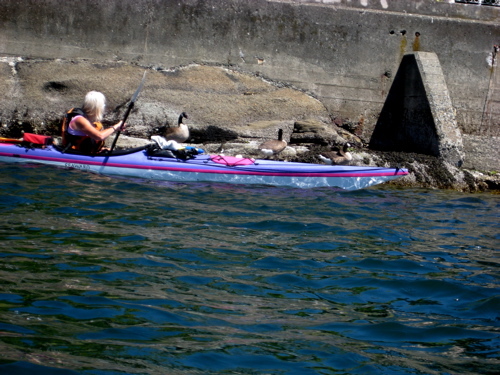 I was also quite impressed by her pink and purple kayak (not to mention slightly jealous)! Soon enough we were ready to head out into the big, blue sea. Though the wind was blowing and the waves were rolling, we pressed onward from Wall Beach to Craig Bay with ferocity in our paddling. After all, we wouldn’t be adventuresses if we let a little bit of wind stop us, now would we? 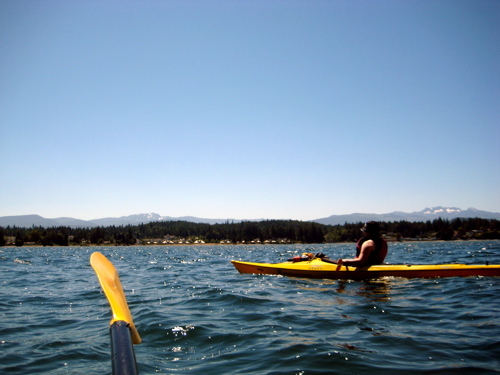 Believe me when I say that there is nothing strenuous or stressful about laying your paddle across your kayak and letting the gentle waves lap and bob your solo vessel in the water for a few moments. Any worries were weightless, completely carried away in the sea. Before long, the clock ticked down and it was time to head back to Wall Beach. Lucky for us, the wind was still blowing and allowed us to essentially “surf” our kayaks back to the shore. And as we all paddled in somewhat reflective silence, I can’t help but think we were all pondering how fortunate we were to be experiencing some place so beautiful by way of an adventure so unique. 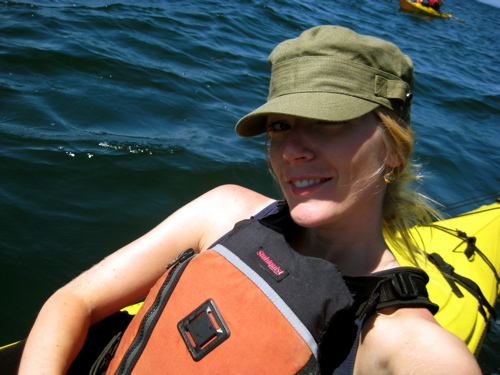 UPDATE: Be sure to read Rebecca’s re-cap of our kayak adventure here. 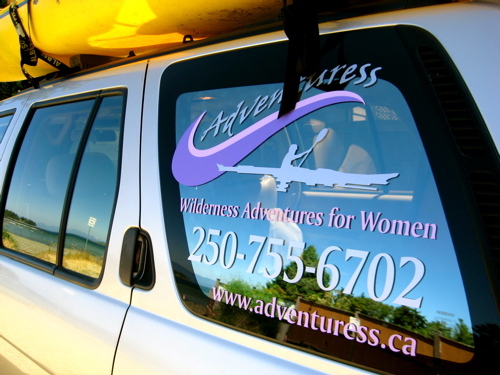 Adventuress Wilderness Adventures for Women operates throughout most of the year with the summer months naturally being the busiest. 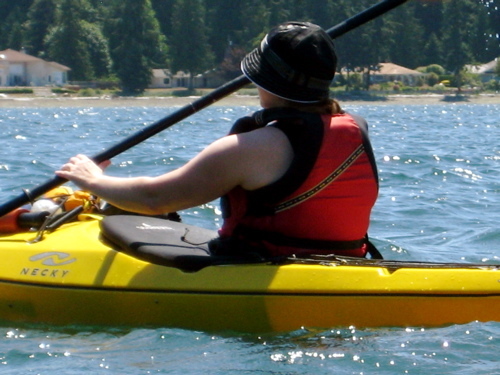 Based out of Nanoose Bay, just 10 minutes south of Parksville, Jan offers half-day, full-day, weekend and multi-day trips geared to all skill levels of paddling. 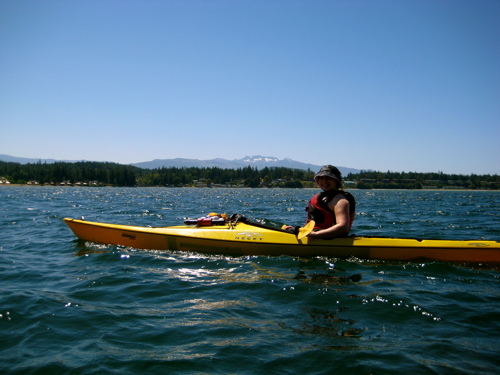 For more information and to book a paddle date with your best girlfriends, you can visit the Adventuress website, e-mail Jan directly or call toll free at 1-866-955-6702. 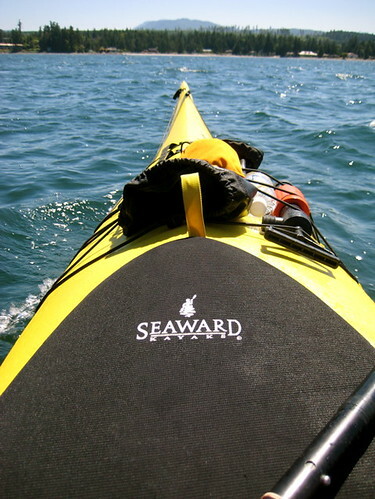 Wow..the ocean was such a beautiful blue that day and the idea of a solo reflective paddle in silence is so appealing. Great article Keira! What a fabulous way to spend a day! Robyn makes fun of me because I want aquasox! 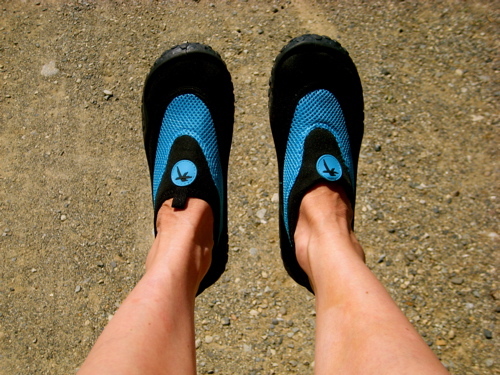 Oh well at least I can use my strapped sandals.